Spring is here in full bloom in the Pacific Northwest. We had a very mild (and somewhat dry winter), when the rest of the country was experiencing record snow fall. I keep waiting for the other shoe to drop, but so far (as I knock loudly on wood) our spring has been pretty spectacular. If the weather can just hold for one more week, it will be a spring miracle. And it will make my daughter so happy…she is looking at the weather app on her phone daily right now, hoping it stays this way. For those of you who know me well, you know that I have 100 things on my mind right now, not one of them pertaining to what we are going to eat for dinner. Oh, and cooking and baking on the weekends? That has gone out the window completely for the past several weeks. I am hoping to get back to it soon. In fact, I know I will be able to get back to it soon. Just after this major milestone, that family and friends will be coming out to celebrate with us. No pressure at all – particularly for my older daughter. None. 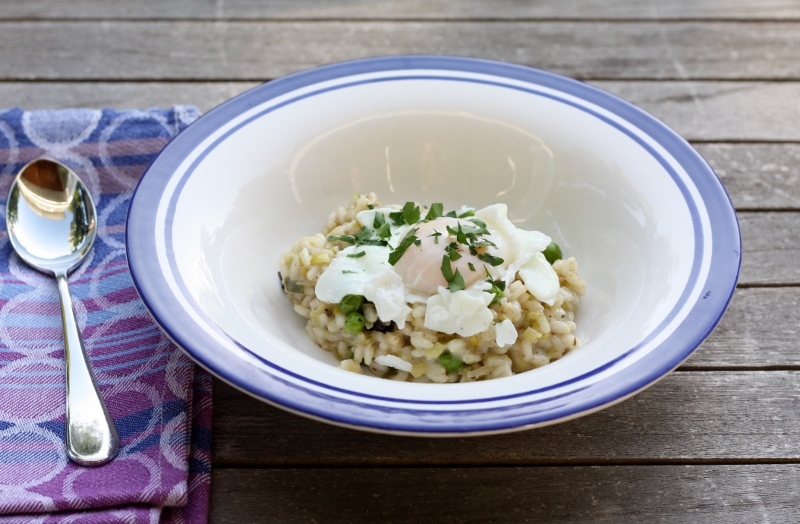 So – if you are wondering how I had time to make this delicious Spring Risotto with Poached Eggs – this has been sitting in the queue for quite some time. About a year to be honest with you – it was just about a year ago when I made this, and just never had time to post it. Once summer came, I decided to wait until spring came again, knowing that I would be a little consumed this year. This recipe from Farm & Larder was the perfect spring meal – and whenever I have an excuse to make some poached eggs, I am a happy girl. Happy spring everyone! Cook fava beans or peas in a large saucepan of boiling salted water 1 minute. Drain; transfer to a bowl of ice water and let cool. Heat oil and remaining 1 tablespoon butter in same pot over medium heat. Add leeks and garlic. Cook, stirring often, until vegetables are softened, about 4 minutes. Add rice and stir to coat, about 2 minutes. Add wine (or chicken broth) and cook, stirring occasionally, until evaporated, about 4 minutes. Add 1 cup broth. Cook, stirring often (no need to stir constantly), until broth is almost absorbed. Add remaining broth by cupfuls, allowing broth to be absorbed before adding more, stirring often, until rice is tender but still firm to the bite and mixture is creamy, about 15 minutes total. Add cheese and reserved beans and mushrooms to risotto. Cook, stirring occasionally, until cheese is melted, about 2 minutes. Season risotto with salt. A few minutes before risotto is done, reheat poached eggs in a large skillet of simmering water, about 1 minute. Divide risotto among bowls and top with eggs, shaved cheese, parsley and pepper. We are in autumn in Sydney but this looks like a prefect meal for this cool weather. Love poached eggs. I bet that egg on top just brings this dish up another notch! I love risotto – in all forms. 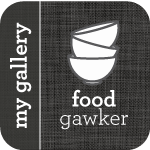 This recipe sounds and looks just great, thanks for sharing and inspiring. Yum! I love risotto- would eat that over pasta any day. I never have thought to put on egg on risotto – but now I have to! Thanks!